Kim Kardashian and Kanye West will have to settle for a tour of the Versailles gardens because they will not be allowed to wed at the history landmark as had been reported. 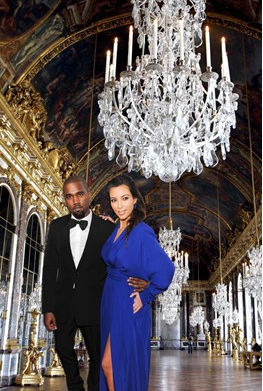 KIM Kardashian and Kanye West have been refused permission to marry in the Palace of Versailles. The couple – who plan to wed in Italy next weekend – will still visit the Paris landmark on the eve of the wedding, despite the public snub. A spokeswoman for the historic palace suggested the couple were not distinguished enough to wed there, but welcomed their "private tour" with family and friends on Friday night. The news is a huge blow to Kim, 33, and Kanye, 36, as the pair had set their hearts on tying the knot in the former home of French royalty and have already landed in the capital. Catherine Pegard, president of the Palace of Versailles, said it just “wasn’t possible”, adding: “Kim Kardashian and Kanye West have decided to visit the Chateau of Versailles with their guests in a private surprise tour organised for Friday, May 23rd, on the eve of their marriage. Kim, Kanye and their guests will be shown around Versailles and its gardens. The bride-to-be arrived in the City of Love at the weekend – along with 11-month-old daughter North, two nannies and 12 suitcases. They are DISGUSTING THINGS....not even human...no soul or heart. Of course they wouldn't let that trash get married on their grounds!! The way that the entire world keeps clowning them is HILARIOUS, lol! Like watching a rusted old train wreck! Dying lauging @Distinctly Her "sad news for the fan" I also checked out your page. Ahh good stuff too bad it is all from early 2013.